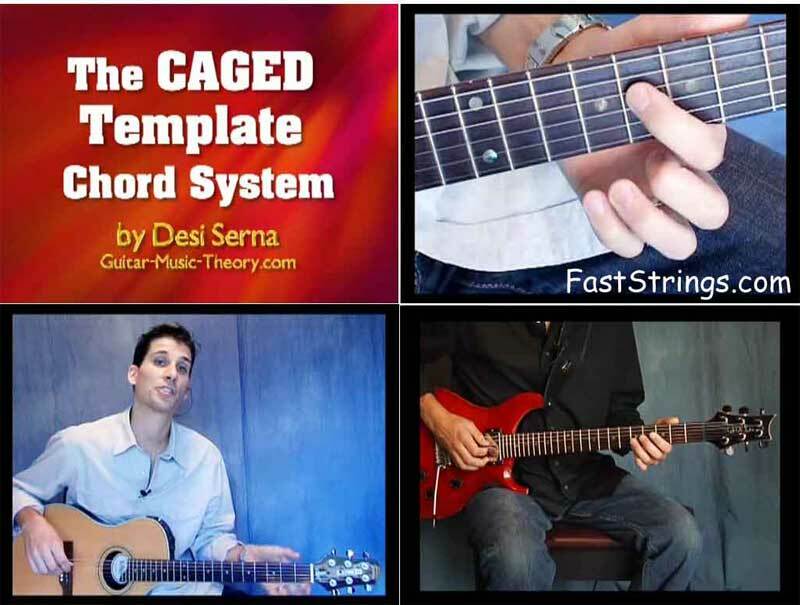 Desi Serna CAGED Template Chord System DVD download. This video program is intended for intermediate to advanced level guitar players who are already comfortable using standard open and barre chords to play songs. There are literally thousands of different kinds of chords and chord shapes that can be played on the guitar, but did you know that most can be traced back to just 5 common open forms? The 5 forms are C, A, G, E and D. What’s that spell? Caged. Each one of these chords can be barred and moved around the fretboard. Each bar chord can be played as a full arpeggio pattern which be broken up into all sorts of chord inversions, shapes and voicings. Video topics covered include creating moveable chord shapes, mapping out arpeggio patterns, playing partial chord shapes and inversions, connecting chords and covering the whole fretboard, playing progressions in different positions and what CAGED songs you should look up and learn. Great rhythm guitar players don’t necessarily use strange chords, they just know how to freshen up common progressions with unique shapes and interesting voicings. Understanding how the guitar CAGED system works is essential for further music theory study. This video program will teach you the CAGED system, how to use it and how each form relates to your favorite songs. The CAGED Template Chord System DVD is taught by music theory expert, guitar teacher and publisher Desi Serna and is based on his book Fretboard Theory Chapter 3. This lesson material is suitable for both acoustic and electric guitar. Serna is very clear and concise in his instruction. His statements are short and to the point. He not only walks through the CAGED chord forms, but follows them up with a natural introduction to arpeggios, chord fragments, and inversions. He provides suggested practice tips are fast, simple and very clever. Another great feature is that he relates his teachings to familiar songs by popular artists. This really gives the viewer a great way to apply what they have learned. No corny background music or unfamiliar musical examples. The pace of the DVD is also great. Serna keeps the material coming; not too fast, not too slow. The camera provides clear views of finger placement. Many DVDs show the guitarists hands at a poor angle or with such poor lighting that it is impossible to really tell exactly what they are doing. In this video, it was very easy to see exacty what was being played. This video is a great resource for for anyone that wants to learn different chord forms and their positions on the neck. Desi Serna does an outstanding job of explaining this technique in the video. This videos is precise and well paced. It keeps your attention as you learn without boring you to death along the way. I love you so much J T.
can you please upload Desi Serna – guitar modes ?? It’s not only the chords, but it’s a little application as well.